Are the city's artworks easy targets for defacement? Last fall, Mark Rothko took center stage at the Goodman Theatre in Red, John Logan’s play about the late artist’s struggle to complete a series of murals for the Four Seasons restaurant. Rothko reentered the limelight on October 7, when a painting from that same commission was vandalized at the Tate Modern in London. A 26-year-old Polish artist, Vladimir Umanets, was charged with defacing Rothko’s Black on Maroon (1958), writing vladimir umanets ’12 a potential piece of yellowism in black ink. 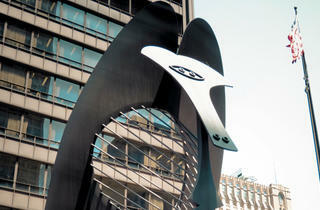 Is art in Chicago susceptible to similar crimes? Spokespeople for the Museum of Contemporary Art and the Art Institute declined to comment when asked if their museums tightened security policies in light of the high-profile incident. “It’s one of the rare things I won’t comment about,” MCA spokeswoman Karla Loring says. Even stringent security doesn’t always deter crafty saboteurs. Police and federal authorities were on high alert the week of the NATO summit in May when a protester managed to mar Daley Plaza’s Picasso statue with a sticker reading ttfra: tax the f****** rich already. Plenty of Chicago artists can speak of the sting of having a work vandalized. In 2010, SAIC grad Anida Yoeu Ali’s 1700%, a piece depicting hate crimes against Muslims, was defaced with drawings during her M.F.A. show at Sullivan Galleries. The perpetrators were never found. During the 2006 show “Laugh Seriously” at the now-defunct Near West Side gallery Butcher Shop Dogmatic, several pieces by Meg Duguid and Catie Olson were destroyed. In response, the artists threw a post-show “destruction party” to “redirect” the vandalism.